A nuclear weapon, also known as a nuclear bomb or a nuke, is a weapon that suddenly releases the energy in the nucleus of certain types of atoms. When triggered, these devices release a huge amount of energy in the form of a nuclear explosion. Nuclear explosions can destroy a city and kill most of its people. They also make nuclear fallout that may also make people very sick. Nuclear weapons are the most damaging weapons to have been created. The first nuclear weapons were built by the United States during World War II. Two nuclear weapons were used to attack cities in Japan. These were the only times when nuclear weapons were used in war. Today, the United States and Russia have the most nuclear weapons. The other countries that have nuclear weapons are: China, France, United Kingdom, India, Israel, North Korea, and Pakistan. South Africa used to have nuclear weapons, but they decided to destroy them. There are two ways to make nuclear weapons: fission weapons (also called atomic bombs or A-Bombs) and fusion weapons (also called hydrogen bombs, H-Bombs or thermonuclear weapons). The way they make energy for the nuclear explosion is different. Fusion weapons make bigger explosions. Fission weapons use a special isotope of uranium or plutonium. Fusion weapons use a special isotope of hydrogen. Nuclear explosion test in Nevada in 1953. 2 How do nuclear weapons work? Little boy, the atomic bomb thrown on Hiroshima, shortly before being loaded on the airplane. In the years after 1895, people studying physics begin to understand how atoms are made. Around 1915, people began to have the idea that breaking special atoms can release large quantities of energy and can be used to make a bomb. In 1939, people studying physics began to understand the theory of nuclear fission weapons, but no country knew how to build one. When World War II started, Germany, the United Kingdom and the United States wanted to build nuclear weapons. Germany did not finish building them, partly because many of the best people studying physics fled Germany after Nazi rule started. The United Kingdom started working in 1939, but it took too much money, so they gave up in 1942. Later that year, the United States started a very large program to build nuclear weapons. It built upon the work done in the United Kingdom. The program was called the "Manhattan Project". By August 1945, the Manhattan Project built three nuclear fission weapons. 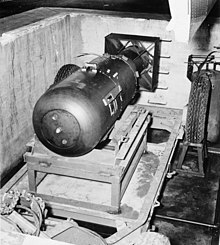 Two of these bombs were used by the United States to attack the cities of Hiroshima and Nagasaki in Japan. People from the Manhattan Project believe that around 105,000 people were killed and 94,000 were hurt when the bombs were used. Medical professionals later came to believe that more than 225,000 people died when everyone affected after long periods of time are counted. Japan announced its surrender after the atomic bombings of Hiroshima and Nagasaki. After World War II, the Soviet Union also began working to create nuclear weapons. British Nuclear Tests Veterans Association memorial in Leicester. One way that nuclear weapons release energy is by breaking atoms apart. This is called nuclear fission and is the basis for atomic bombs. Specific isotopes of uranium or plutonium are typically used in these weapons. These elements can be made to undergo nuclear fission and have a nuclear chain reaction. Another process can be used to create nuclear weapons that create even bigger explosions and release much more energy by fusing atoms together. This process is called nuclear fusion, and weapons based on this process are called hydrogen bombs or thermonuclear weapons. Specialized isotopes of hydrogen are typically used in these weapons. Nuclear weapons produce a very large amount of energy and radiation, which can kill people or animals within several kilometers. Most of the radiation is X-rays, which heats the air to produce a huge nuclear fireball. The rapid expansion of the fireball creates a dangerous shock wave that can destroy houses or buildings several kilometers away. The radiation can cause radiation poisoning and also has the potential to cause mutations in the DNA, which can cause cancer. Nuclear bombs also release fallout, which is nuclear material and dust that has been irradiated and become radioactive. Over time the radioactive fallout can potentially kill people farther away, depending on how much was released. Fallout from a nuclear explosion can be blown by the wind large distances from where the explosion occurred, and can remain dangerous for long periods of time. A hydrogen bomb, also known as a fusion bomb, is a nuclear weapon which utilizes hydrogen isotopes (deuterium and tritium) in addition to uranium or plutonium. Hydrogen bombs have the potential to be much more powerful than fission bombs. Despite the name, a typical hydrogen bomb only has enough hydrogen to produce additional neutrons to detonate a casing made of natural uranium. The fuel in hydrogen bombs is thus mostly unrefined uranium. Nuclear weapons are difficult to build because they need special isotopes of uranium or plutonium, as well as specialized technology. This is why few countries have nuclear weapons. When countries without nuclear weapons create their own, this is commonly referred to as nuclear proliferation. Getting a nuclear weapon to its target can be as hard as making one. The explosive material can be placed in a bomb or artillery shell, or into a missile. When a nuclear device is placed on a missile it will commonly be called a nuclear missile. Nuclear missiles can be carried by airplanes, submarines, or trucks, or they can be placed into underground missile silos. Some kinds of airplanes like the B-29 Superfortress, B-36 Peacemaker, B-52 Stratofortress and B-2 Spirit have carried nuclear weapons. They are also carried by missiles, such as intercontinental ballistic missiles (ICBMs) or submarine-launched ballistic missiles (SLBMs). Some missiles travel to the border of space, and then launch a number of separate nuclear weapons back toward the ground, with each weapon travelling to a different target. This is called a MIRV Warhead, or Multiple Independent Reentry Vehicles. Very large nuclear bombs have been produced, but in practice a weapon with multiple warheads can produce much more damage by attacking more targets. Nuclear weapons take many resources to make, because the materials they are made of are very rare and it takes many scientists to make them. But several countries have managed to create nuclear weapons and many have them today. The countries that possess nuclear weapons are listed here in the order that they were invented: United States (1945), Russia (1949), United Kingdom (1952), France (1960), China (1964), India (1974), and Pakistan (1998). Other countries are believed to secretly have nuclear weapons or develop them. Some countries used to have nuclear weapons, but have since then said that they had gotten rid of their nuclear weapons. Some countries have lost nuclear weapons while transporting them. There are 92 known instances of atom bombs being lost at sea by all the countries known to posses them. Bombs have been lost in 15 different cases. However, there could be more lost bombs. This is a list is of the main nuclear explosions which have happened. As well as the atomic bombings of Hiroshima and Nagasaki, the first nuclear test of a given weapon type for a country is included, and tests which were otherwise notable (such as the largest test ever). All yields (explosive power) are given in their estimated energy equivalents in kilotons of TNT. 1945-08-06 Little Boy 12–18 USA Bombing of Hiroshima, Japan, first detonation of an enriched uranium gun-type device, first use of a nuclear device in military combat. 1945-08-09 Fat Man 18–23 USA Bombing of Nagasaki, Japan, second and last use of a nuclear device in military combat. Over 500 atmospheric nuclear weapons tests were done at various sites around the world from 1945 to 1980. As public awareness and concern grew over the possible health hazards associated with exposure to nuclear fallout, various studies were done. A Centers for Disease Control and Prevention study says that nuclear fallout might have led to 11,000 excess deaths, most caused by thyroid cancer linked to exposure to iodine-131. ↑ The Atomic Bombings of Hiroshima and Nagasaki: Total Casualties from the Atomic Archive, retrieved on 27 December 2014. ↑ Hiroshima and Nagasaki Death Toll from Children of the Atomic Bomb, retrieved on 27 December 2014. ↑ Brown, Jerry and Rinaldo Brutoco (1997). Profiles in Power: The Anti-nuclear Movement and the Dawn of the Solar Age, Twayne Publishers. ↑ Ben Goddard (2010-01-27). "Cold Warriors say no nukes". The Hill. ↑ Ancient Rockers Try to Recharge Anti-Nuclear Movement Business & Media Institute, November 8, 2007. ↑ Falk, Jim (1982). Gobal Fission:The Battle Over Nuclear Power, p. 95. ↑ Renee Parsons (2012-04-16). "No Nukes and Intervening Women". Huffington Post. Wikimedia Commons has media related to Use of nuclear weapons. This page was last changed on 17 April 2019, at 07:26.